A tough little dog, mischievous and cheeky in equal measures. The name derives from the German for "monkey-like terrier" due to their round eyes and inquisitive expression. 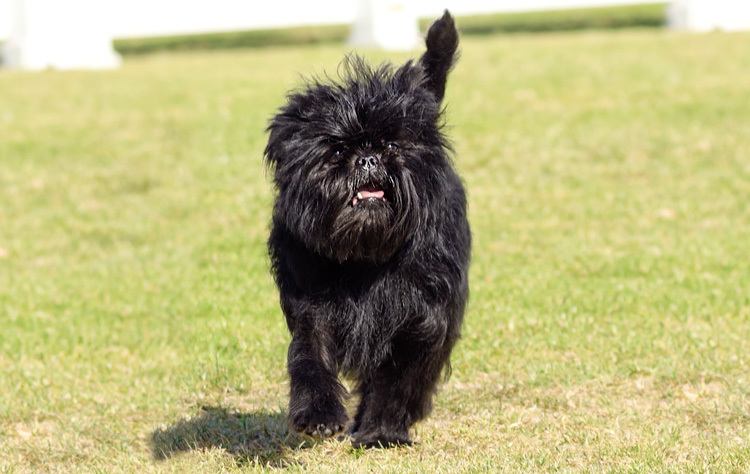 The Affenpinscher is a great watch dog and will help control any vermin, but they're also loyal and confident, the Breed Standard notes how they will appear to be "carrying itself with a comic-seriousness". Classified as a Toy breed despite its terrier heritage. Lively and affectionate, the Affenpinscher responds well to training and socialization although they'll remain suspicious of strangers and protective of their pack making them useful as a watchdog, where it will bark to raise attention. The Affenpinscher is comfortable being a house dog, their primary concern is companionship. The Affenpinscher is a small dog and the Breed Standard expects a height of between 24-28cm. Their weight should be between 3-4kg. Not as susceptible to Hip Dysplasia as larger breeds, however as with all purebred dogs it is a present risk, take care to check the pedigree and be careful with exercise in the early stages. Despite their small size the Affen is relatively hardy. Lifespan should be up to 14 years. Just be aware of their small size leading them into tight areas and getting caught underfoot. Also overfeeding can become a problem, especially with relatively inactive dogs.